Kabbalah is a method that teaches how to create a positively connected society of happy individuals, balanced with nature. Everyone wants to be happy. There are myriad interpretations of what happiness is, how to be happy, and what the source of happiness is, and certainly, if we could identify an authentic source of happiness, then we could be confident in a goal to aspire toward. defining an authentic source of happiness and the kind of transformation needed to experience it. IS THERE SUCH A THING AS AN AUTHENTIC SOURCE OF HAPPINESS? Is happiness subjective and relative to every person, or can there be a source of happiness common to all? In order to examine these questions, it is important to view ourselves as a social species, viewing our lives in connection with others, and that the quality of our connections influences our perspectives and sensations of happiness. The fact that we’re a social species differentiates us from animals. We are molded and affected by our surroundings at every moment of our lives. Our birthplace, where we’re raised, our families, schools, teachers, friends, work colleagues, as well as our culture and the media we absorb and engage with, all influence our definitions of what it means to be happy, how we can achieve happiness and what we do in order to achieve it. Many happiness studies have already concluded that a positively connected and supportive society provides the basis for its members’ happiness. A social foundation where everyone tends to each other—receiving as much as each individual needs and working for everyone’s benefit—is an optimal setup for each person’s happiness. WHAT INTERFERES WITH OUR HAPPINESS? The problem is that where there is society, there are social desires, i.e. desires for money, honor, respect, fame, control, power and knowledge. Our individual pursuits to fulfill these desires at others’ expense interferes with our happiness. For instance, if a person wants to become rich, powerful or famous, he must continually struggle to out-compete others, building his pursuit of such goals by disturbing or ruining the wealth, power or fame of others. Moreover, human nature, which is a desire to enjoy, works such that when we enjoy something, our desire for that enjoyment extinguishes upon its reception, and a new desire surfaces in its place. This modus operandi of human nature makes us feel constantly unsatisfied and wanting. 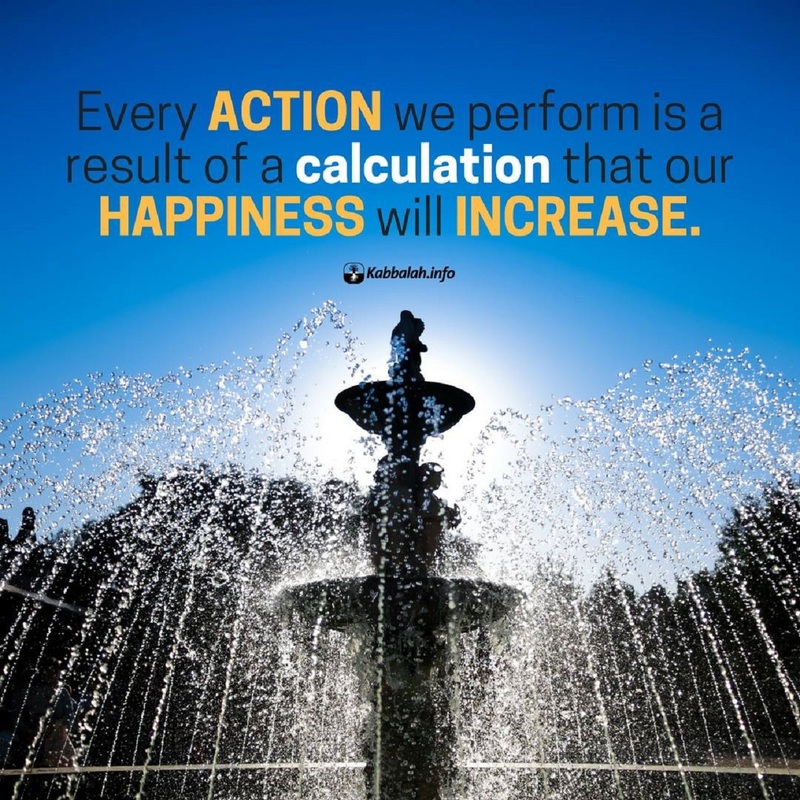 This formula we live by—the pursuit of happiness at others’ expense coupled with the constant dissatisfaction embedded in human nature—is the antithesis to happiness. It can then be concluded that if our sources of happiness remain as individual quests for pleasure at others’ expense, we will never experience a lasting, blossoming form of happiness. We will be plagued by our desires becoming emptied all the time, and will endure increasing dissatisfaction until we will ultimately despair from trying to make our way in society with competitive, individualistic motives. It is a must for every nation to be strongly united within, so all the individuals within it are attached to one another by instinctive love. Moreover, each individual should feel that the happiness of the nation is one’s own happiness, and the nation’s decadence is one’s own decadence… It means that the people of that nation, who sense that harmony, are the ones who make the nation, and the measure of happiness of the nation and sustainability are measured by their quality. – Kabbalist Yehuda Ashlag, The Nation. Public opinion today venerates rivalry and individual achievement. In other words, if you trample upon your competition in order to succeed as an individual, you’re viewed with respect. It is an interwoven symptom of the individualistic-competitive values we are raised with, from our schools and universities, through the films, music, media, TV shows and Internet discussions we regularly engage with. Therefore, if we seek an authentic source of happiness, we need to first surmise that nothing will change if our egoistic human nature continues absorbing social influences that feed into its selfish direction at others’ expense. Even if we define an authentic source of happiness that can satisfy everyone—a limitless form of pleasure that fills us when we engage in giving to and positively connecting with others—we still won’t experience lasting happinessif society as a whole fails to prioritize values of giving, kindness, altruism and positive connection over present-day competitive-individualistic values. WHAT WILL INCREASE AWARENESS OF THE AUTHENTIC SOURCE OF HAPPINESS? The rise in misfortunes and problems in human society will play their role to raise awareness of why we fail to achieve an authentic and lasting form of happiness. In the wisdom of Kabbalah, this state is called “recognition of evil.” It means that problems and crises accumulate until we see that as much as we want to live happy and harmonious lives, we don’t, and moreover, the situation worsens. Eventually, we will realize that the solution is in a fundamental shift of our values—from competitive-individualistic-egoistic values to cooperative-connected-altruistic ones—and that the educational institutions and media permeating values into our lives need to accept major responsibility in such a transformation. The very appearance of happiness science and positive psychology in an age where depression has risen to become the world’s most prominent disease shows a clear example of how, as our sorrows worsen, we seek to counter them with an antidote. It is this same era that the authors of The Book of Zohar, as well as the most renowned Kabbalist of the 20th Century, Yehuda Ashlag (Baal HaSulam) stated that the authentic wisdom of Kabbalah would become revealed and available to all, as a method to guide society to the kinds of positive connections that can make everyone happy. Kabbalah is a method that teaches how to create a positively connected society of happy individuals, balanced with nature. It does this by guiding its participants through a process of experimentation in connecting with others in order to attract a force of connection dwelling in nature, which has the power to change us to make us more considerate of each other. Thus, a person will learn to aspire not only to fulfill his or her own happiness, but that of others as well. A harmonious human society will then be built to ensure the happiness of every individual. PhD in Philosophy and Kabbalah. MSc in Medical Bio-Cybernetics. Author of over 40 books on spiritual, social and global transformation.